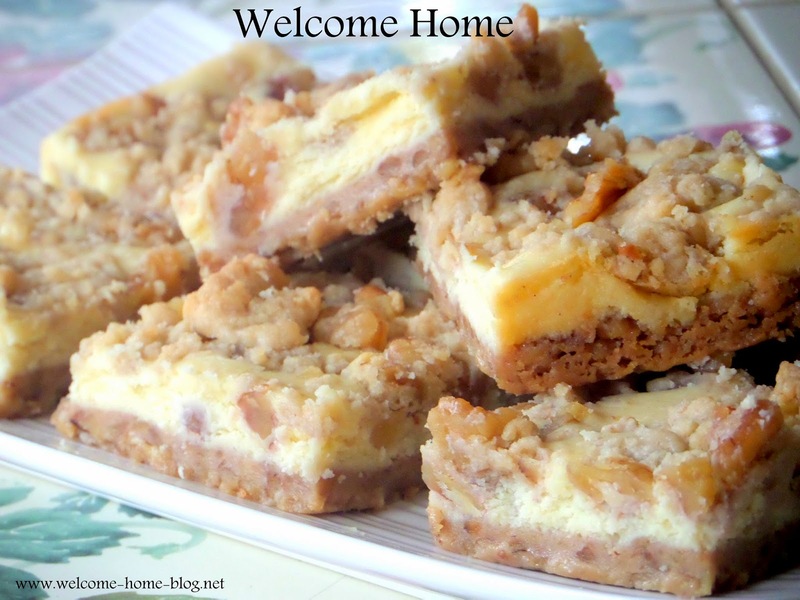 Love these little cheesecake bars and I made them this past weekend to give to some friends that stopped by. They loved them too! So easy to make and so delicious. You can use whatever nuts you like. This time I used walnuts but I have also used pecans and toasted almonds for change now and then. Click on photo for a closer look at the creamy texture. Preheat oven to 350 degrees. Line a 13 x 9-inch pan with foil and grease bottom and sides. To make the crust, in a medium bowl, sift together flour, baking powder and salt. In a large bowl, using a mixer on medium speed, beat together butter and sugar until creamy, about 1-2 minutes; reduce mixer speed to low and beat in flour mixture until just combined and crumbly. Press mixture into bottom of prepared pan. Bake for 10 minutes or until light golden around edges; remove from oven. Mix cream cheese and sugar with electric mixer on low until smooth. Add remaining ingredients and stir gently until mixed. Pour batter into the baking dish over the prepared baked crust. Bake for 20 minutes at 350 degrees. Don't bake too long, or filling will be dry and not creamy. To make the topping, in a medium bowl, stir together brown sugar, flour, walnuts, cinnamon and salt, until combined; add in butter using fingertips or a fork, until ingredients are well incorporated and start to clump together. Sprinkle the crumbly mixture evenly over the cheesecake filling. Return pan to oven and bake an additional 10 minutes or until golden brown. Remove from oven and cool for an hour. 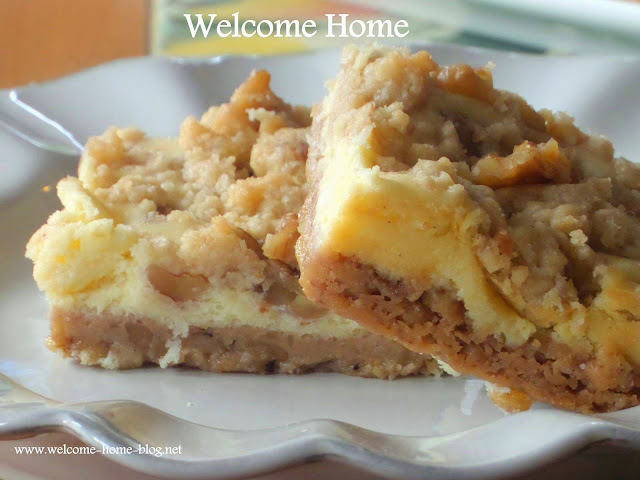 Slice cheesecake into rows, 3 x 5 to make 15 bars.